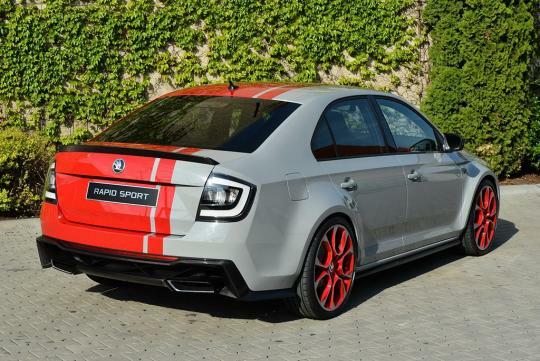 The Skoda Rapid Sport concept will make its world premiere at the Worthersee tuning show in Austria. The concept gives the plain looking Rapid sedan an extreme makeover and turns it into a boy racer's fantasy. The Sport Concept is painted in two-tone metallic Steel Gray and Corrida Red and wears aggressive 19-inch red alloy wheels. The exterior is complimented by a body kit and twin exhausts pipe at the rear. The darkened side mirrors, head lights and grille remind us that this is a rapid sedan from the dark side. The recessed hood completes the external updates. According to Skoda, the sporty layout continues in the interior of the car, with a sports type steering wheel, Recaro seats and illuminated door sills. No engine details are available at the moment but given its promising looks, anything less than a 2.0-litre TSI would be a disappointment. Marking the 32nd year of the Volkswagen Group event, the 2013 Worthersee show takes place in Reifnitz, Austria between 8th to 12th May. 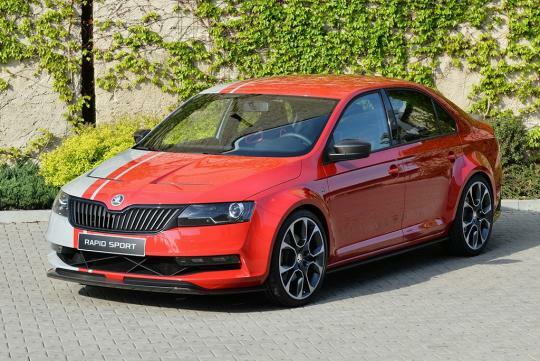 Skoda will display the Fabia RS Motorsport, Citigo Motorsport and an accessorised 2013 Octavia Combi alongside with the Rapid Sport Concept.